Tomato canning was once a prevalent activity that bonded American families together. It was an activity that would require months of hard work and years of training. It was a process that entire families, from young to old, would take part in and enjoy. As America moved further into the 20th century, tomato canning, and canning in general, became less prevalent throughout the United States. This was the result of multiple modernizations within society, such as the rise of grocery stores, the migration of people from rural areas into urban cities, and the expansion of those cities outward. Our goal with this ethnography was to examine the effects of modernization on tomato canning and how relationships formed by tomato canning changed in response. The main aspect of modernization that we focused on was how the number of grocery stores grew throughout the 20th century. We believe that by looking at the kinships formed through the canning process, and how those relationships have changed over the past decades, we will be able to learn how the modernization of America has changed not only family dynamics and intergenerational ties but the activities these families participated in. We have interviewed individuals who experienced the shifts in the popularity of canning and those who came after. These individuals have lived in both rural and urban areas of the county and grew up canning differently. The main propose of canning in generations past was to make sure one’s family had enough food to survive through the winter. Canning was a way for the family to carry over excess food from summer, when it was abundant, to winter, when food would be scare. Beginning in the 1790s, a time when France was in upheaval due to the French Revolution, the French Navy offered a prize of 12.000 francs to the man who found a reliable method of preserving food for long periods of time. Canning during the war was not popular among the general public due to fears of possible disease and price. The modern canning industry created by Appert was mainly used by “soldiers, sailors, pioneers, and explorers…” (Dicke). However, after the war, it gained popularity among the general public as a way to preserve foods. At the dawn of the Civil War in America, canning took on a new life. Demand for canned meats and vegetables increased as men went off to fight and more people were exposed to canned foods. The war, with it’s large demand, increased the ability for canning companies to be founded and compete with one another, leading to more technological advancements and causing prices to drop. (Dicke) From that time on, canning would steadily increase until the 1920s and 30s, when the process peaked. The Civil War also caused diets to drastically change. Americans now had the ability to keep food for months longer, opposed to the week or two they could originally keep fresh ingredients. They were able to have vegetables and fruits that were out of season, especially as the American transportation systems were created and perfected across the continent. This allowed out of season produce to be transported to different parts of the country. Americans were now exposed and willing to accept a process once thought to be dangerous as prices were cheaper and an established market was created. Commercially processed food became the staple in American diets opposed to the fresh, in-season foods once common. Tomato canning can be done numerous ways and canners have a variety of opinions on which way is the best and what tastes the best. Our key informant, Angeline Krajewski, began canning in the 1940s as a young girl living on her family’s farm in rural Pennsylvania. She learned by assisting her mother and grandmother and taking on the jobs of weeding the fields and helping with harvest when she wasn’t canning. Her family would can roma tomatoes that grew on their land and would process it into a variety of tomato treats such as sauce. Roma tomatoes are said to be the best for canning as read in “Studies on Canning-qualities of Tomato” by Rao and Choudhury. 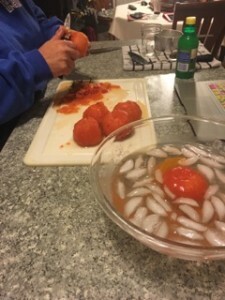 Other types of tomatoes commonly used for canning, as seen in the article, include pusa ruby, chico grande, sugar gimar, and Italian red pear. The major difference between our informants and their canning process was the way they released the air from the jars of the fruit. Angeline Krajewski grew up and taught others that the air could be released by placing the jars in boiling water and waiting until the lid of the jars popped. The popping showed the canner that all the air inside had been released and the jars could be placed aside for later. Our other informant, Mary Tate, grew up in the 1950s watching her mother use a pressure-cooker to get all the air out of the jars. They had lived in suburban Flint where tools, such as a pressure-cooker, could be bought. Tate later used a pressure-cooker for her canning activities once she moved into her own home and became married. Our video displays the canning process of Joe Hair. The son-in-law of Angeline Krajewski, Hair has grown up and lived in the suburban communities found throughout Michigan for most of his life. He learned to can in 2005 after Krajewski’s husband passed away and Krajewski wanted someone to can with. The process seen below is a process traveling back to the early 1900s rural Pennsylvania. As modernization took hold of America, the social and familial relationships created from canning reflected the difference of locations for our informants. In the rural communities, many of the families experienced isolation from modern conveniences such as grocery stores as seen in Krajewski’s childhood. The ability to travel was made hard due to complications in transportation. Her family was unable to travel to the city and buy groceries due to the distance and impossibility of walking there. Krajewski remembers her family only having one car that was needed and used for their farm. She wasn’t able to use the car to go purchase things that far away. It was also seen as a waste of resources since most of the products they would buy could grow on her family’s land. Due to this distance and isolation, the farm was the place for the family’s socialization, food production, and daily lives. Everything the family needed was in the house and on the land. Everyone relied on each other to participate in the work and take part in the family businesses. These ideas about family and work had been around for years as residents of these rural communities had typically grown up and lived their entire lives on farms and rural areas. They only knew and taught self-sustaining practices. They had never experienced anything else. Agriculture and self-preservation was an ingrained mind-set. In the urban communities however, working outside the home and not on the land was the norm. Residents had little or no land to work on, depending on their location and closeness to the city center. Those inside the city had no opportunity to own plots of land for small gardens due to apartment living and low wages drastically limiting them in the ability to can. Those able to live outside the city, in the suburban areas that surrounded it, had a better opportunity to have small gardens on their land but it was done as a hobby. Joe Hair reiterates this point by saying, “living in urban and suburban areas causes people to buy vegetables and fruits instead of growing them themselves. People in urban communities don’t have access to land the same way rural residents do.” These urban residents also didn’t have time to focus on growing and producing their own food, as they worked in factories and other businesses found in the cities. They had to produce for the growing consumer market, causing them to become apart of the consumer market. This focus on work outside the home lead many families to have limited interactions. The children would go to school and the parents would go to work. Some parents would work overtime leaving the children home alone or with a neighbor. There was very little time to make the food let alone find time with everyone to eat it together. Mary Tate remembers sitting down for family dinners during her childhood but as she became a mother herself, she had very little time to do this with her own family. Her husband typically worked late hours and her two children had multiple afterschool activities. She remembers and still makes sure that everyone is present for meals with significance such as Christmas dinner. Modernization of kinship based on canning was also reflected in the way canning was taught to the younger generations. Krajewski was taught canning on the farm as a way to preserve food for when it was scarce during the Pennsylvania winters. It was an activity that lasted days and guaranteed the family time together and food. Tate wasn’t taught by anyone. She remembers growing up and watching her mother can as a hobby. Her mother had a strong belief that the pressure-cooker was too dangerous for her. This limited Tate’s opportunity to learn as a child. She did however, help by weeding the garden and picking the vegetables with her father. Tate did eventually taught herself canning by buying herself recipe books that discussed the process and how to make certain things. 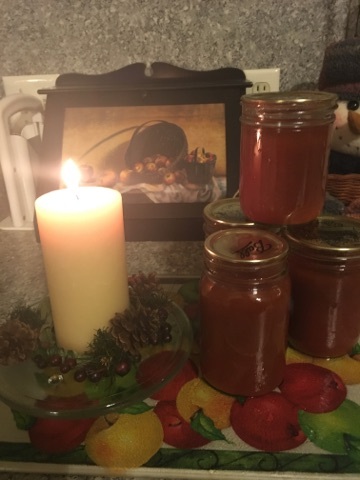 She remarked, “I learned how to do canning the right way.” Joe Hair was taught canning by Krajewski because of his expressed interest in the topic and her need to teach and share the process with someone after her husband died. For Krajewski and Hair, canning was an activity that focused on the social aspects during the process. They would work with others and each other to produce the canned tomatoes. It was a process to be shared from beginning to end. Tate on the other hand, found canning to be individually friendly. She would prepare the jars of the canned fruits and sometimes vegetables on her own time. Tate would then go throughout her community and share her produce with others. She focused on sharing her process at the end instead of throughout.This showed us that canning now only connects family members and those of different generations but also within the outer communities. Despite the abundance of products, Krajewski, Hair, and Tate have all advocated for home canned products opposed to the ones sold on store shelves. Krajewski believes that the store products “taste funny” due to the preservatives that exceed the once commonly used lemon or lime juice. Hair and Tate also disliked the idea of the added preservatives and believed that the canned tomatoes they made tasted better. Even with these reasons, all three of our informants do little to no canning anymore. Krajewski, having moved further away from her family, sees canning for herself would lead her to waste most of it. Canning for her has been a way for the family to connect and have things they need. Canning was never just a hobby or something she did to feel connected to her childhood again. She also believes that being in her eighties she is too old to can. The process, which is extremely hands-on, takes much more of her energy than it did a few years ago. She also believe that for her current lifestyle the grocery store is more convenient for her. Tate no longer cans as well for a number of reasons. She no longer has her pressure-cooker which she loved using when she canned. 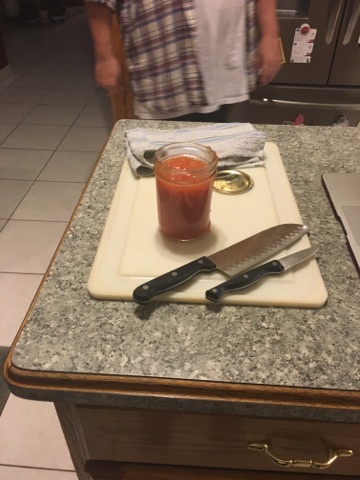 For her canning, has always included it so learning to can a different way is something she’s uncomfortable with. She also no longer has a garden space to grow her tomatoes and other crops.If she’s going to can she wants the fruits and vegetables to come from her own garden and not from a store shelf. Hair is the only one that still cans but he cans very little. He says that the only real time he cans is with his wife. Canning for him was a social activity and a way to bond with others. Now, due to everyone’s busy schedules, he and those he cans with have very little time together to can. Canning brought families closer together. It was a way for recipes, legacies, and tradition to be passed on from one generation to another. It was a way for the communities to share their harvests and abundance. Canning created relationships. With the rise of grocery stores, children now experience a different kind of tradition. They no longer get to see the process and time it takes to preserve one’s own food, learning step-by-step the things their ancestors did to survive the winter months. Children now see the lines to pay for prepackaged and processed food and never experience a longing or desire for things that once tasted better, as stated by our informants. Communities were once closer as well. Talking about farming and canning was a chance for neighbors to socialize and share their harvests. They were able to help one another out when gardening or preparing the jars. Canning was a way for everyone in a community to connect and enjoy one another’s company in both the rural and urban areas. We believe that tomato canning and canning of other fruits and vegetables will continue. Many people have begun to turn back to a more natural and organic based diet. These people are growing gardens, reading books, and joining groups online to learn all there is to know about canning and the processes. However, canning will likely never be as prevalent as it once was. It has changed from a way of life to a hobby. It has, however, kept its social aspects and will continue to be a means of keeping family and neighborhood ties alive. Boyer, Renne R., and Julie McKinney. “Boiling Water Bath Canning.” Virginia Cooperative Extension (2013): 1-15. Web. 5 Dec. 2015. Dicke, Tom. “Red Gold of the Ozarks: The Rise and Decline of Tomato Canning, 1885-1955”. Agricultural History 79.1 (2005): 1–26. Web. Kuhn, Clifford M. “”It Was a Long Way from Perfect, but It Was Working”: The Canning and Home Production Initiatives in Greene County, Georgia, 1940-1942.” Agricultural History 86.2 (2012): 68-90. Web. 5 Dec. 2015. Rao, M. Rama, and B. Choudhury. “Studies on Canning-qualities of Tomato.” Scientia Horticulturae 14.4 (1981): 299-305. Web. 5 Dec. 2015. Rock, Cheryl, Wade Yang, Renée Goodrich-Schneider, and Hao Feng. “Conventional and Alternative Methods for Tomato Peeling.” Food Engineering Reviews Food Eng Rev 4.1 (2012): 1-15. Web. 5 Dec. 2015. Gwynn, David. “A Quick History of the Supermarket.” Groceteria. Web. 8 Dec. 2015. Ellickson, Paul B. “The Evolution of the Supermarket Industry: From A&P to Wal-Mart.” SSRN Electronic Journal SSRN Journal (2015): 1-28. Web. 8 Dec. 2015.